Aloha and E Como Mai (welcome) to Lavabull English Bulldogs! 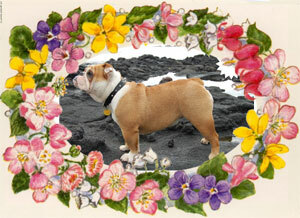 We are a caring English bulldog owner & quality breeder located on the island of Oahu in Hawaii (occassionally also on the Big Island). Our bulldogs are part of the family & we love "talk'n bully" with other owners & helping to educate the general public about this special breed. Our dogs & puppies receive the best in care and we believe strongly in being properly educated before owning or breeding this special kind of dog. Any breeding we undergo is done with extreme seriousness & with the goals of keeping our female happy & healthy throughout the process & producing the best possible puppies regardless of cost - with special attention to health, confirmation (breed standards), and temperament. We've made this website mainly for educational purposes (& for fun!). Enjoy the information & pictures & if you'd like to be on a wait list for puppies, please contact us (the website will ALWAYS be updated with any breeding or puppies). We hope to also make this website into a bulldog community where owners & future owners can share opinions, tips, & fun bulldog stories/pictures!